You need to be proactive, be in full control of all aspects of your business and develop a considered strategy for the future. You will need information, people, time and finance and we are here to help. We can provide fixed quotes in respect of our fees which can be payable by standing order. 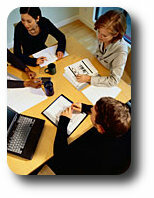 As accountants obviously we prepare your financial statements and deal with all your tax affairs. However our job does not start there, first we look at what you do and how you do it and then show you a simpler method of maintaining your records so that you get the maximum benefit from your work, we get better records from you and you don’t get into trouble with your bank. Our sister company, GGS Consulting Limited, is registered to carry out audit work in the UK by the institute of Chartered Accountants in England and Wales. We can provide you with a competitive quote on request. Audit registration details can be found here or search at www.auditregister.org.uk under reference number: C001408793. Budgeting is extremely important especially when the business is facing a tight cash flow or profit margin. We can set a comprehensive budget and then help you to monitor the actual performance and prepare variance reports, which will help you to make the appropriate decisions. If you are thinking of expansion through acquisition or disposal of part or all of your business, talk to us. We need to plan both events well in advance of any action. Using computerised registers we can handle all your company's statutory requirements. We have successfully launched a number of profitable businesses and can help you to achieve your goals. We have management and administration as well as IT skills in house and can help you to develop the strategies and the team to take your business to where you want it to be. Far too many businesses are easily satisfied with what they are offered by their bank manager. There are many alternatives to the high street bank and we have a proven record of improving clients financing structures, sometimes with their existing banks. See the section under Commercial Finance for more details. We will evaluate your project including logistics, local labour force, capital requirements, planning issues and all the financial aspects and produce a report in a simple format to help you decide on the best route forward. We will then recruit the key people required to fulfill your requirements, provide every one with an organisation chart and task list and monitor the progress of the project. Our level of involvement is determined by you and can be as little as consultation on single issues throu to full project implementation and management. Management accounts are required sometimes by lenders but more importantly are used by the directors to get up to date information and feed back PRIOR to making decisions. We can set up reporting facilities to provide you with monthly, quarterly or prior to year end management information using a combination of software and common sense. We operate a payroll bureau for a number of clients and can save you the hassle of running your payroll by providing the payslips as required and dealing with the payments and the year end returns for as little as £1.50 per month per employee (depending on the size of the payroll). Why not talk to our payroll department before deciding on who should operate your payroll. Our level of involvement is determined by you and can be as little as consultation on single issues through to full project implementation and management. All Self Assessment Tax Returns are prepared using the latest software linked to the accounts preparation data so the work can be carried out speedily and efficiently. We can help you to improve your processes by using the latest technology in administration, accounting, monitoring, customer relations, credit control and communication. We recruit and train key staff for your organisation you will see the benefit of your investment in the short term. The correct software for your business, operated by trained staff, will reduce your running costs substantially as well as providing you with up to the minute reports and customer retention benefits. Call us to arrange an interview and see how it all works. Tax Planning simply means reducing your liability to tax as much as possible by setting up your business and personal affairs correctly. Whilst doing this we will also bear in mind your personal and business requirements and your medium and long term goals so that you don’t lose access to your assets to save tax. The internet reaches more people and businesses, advertises your services and is an effective form of promotion that increases your profitability. Developing an online strategy and web presence is the first step in profiting from the Internet. However, these are areas where people often feel uneducated. We aim to help you learn everything you need to know to make intelligent and cost effective decisions. Businesses need to stand out from the competition and to deliver a better service and product in order to maintain and increase profitability.